Dr Aimee Grant from the Centre for Trials Research qualitative team talks here about her upcoming book on social research published by Routledge, Doing EXCELLENT social research with documents: Practical examples and guidance for qualitative researchers, which is available for pre-order with a 20% discount using the code: FLR40. What do you mean or understand by ‘document analysis’? Documentary analysis is when a document, like a government policy statement, newspaper article or medical notes, are used in a research project. There isn’t one type of documentary analysis, and a whole range of analysis techniques can be used. At the most basic this would be counting how many times something happens (such as a particular word, or something being included in images), all the way through to considering why a particular word was used, and what that might mean about the writer’s intention. Within a trials context, we can use documentary analysis in lots of ways, including analysing diary content to understand how an intervention is delivered in real life (as in ASSIST+Frank and Mam-Kind), or through observations which include the use of patient medical records (as in PUMA). Why is documentary analysis so important? Our society is full of writing – a lot of people have to keep written records in their jobs, the government creates huge amounts of paperwork, and the majority of the population have at least one social media account. We write more now than ever before, and much of this is available to researchers to help them understand society, and try to draw attention to or solve social problems. Because there is so much written content available these days, and because documentary analysis is cheap and able to fit in around other commitments, many social scientists do research with documents. Why was the literature sparse in this area? I’m not sure, but the same two or three books have been recommended to students for over 15 years. These days there is more of a critical stance towards reflection in qualitative researchers, accordingly it is necessary to update the lessons in these texts. What gaps does the book help to fill? The new book builds on the lessons in the current documentary analysis books. It fills two gaps. First, it expands documentary analysis into new areas – considering social media content and visual methods (the Health and Wellbeing in Pregnancy project at Centre for Trials Research is described in Chapter 8, which will be freely available through gold open access). Second, it presents six case studies describing the documentary analysis research process from selecting research questions and data, through to showing each stage of the analysis process. In each of the chapters a different analysis strategy is presented, including thematic analysis, discourse analysis and content analysis. What excited or interested you most about this book and project? I’ve been grappling with documents in research projects since my undergraduate dissertation. The research methods literature for interviewing and observations was quite easy to translate into practical steps, but I found it difficult to understand exactly what I should be doing with the documents I had collected. These challenges continued in my masters and doctoral research, which also used documents as data alongside interview and ethnographic data. More recently, I’d discussed this issue with colleagues and found that other people experienced these challenges, or those supervising students felt that they didn’t have a good source to direct them to. In the social sciences, publishing books is much more important for your career than in medicine, so I decided to submit a proposal to a publisher, and was very surprised when they said yes. What do you hope this could do for the reader? My hope is that this book will make it much easier for researchers to understand how to use documents in their research projects, either alongside another method like interviewing, or by themselves. There is a checklist in the concluding chapter, which will guide the researcher from start to finish in terms of planning their research (and/or drafting a protocol), keeping records of relevant decisions (to make writing up easy) and analysing their data. I was really surprised when I was offered a book contract within a few months of submitting my proposal; most people find it takes several publishers and years. In order to fit this alongside my day job, I read Turbocharge Your Writing and followed many of the lessons. I started off taking the proposal and copy and pasting each chapter into a new document. This gave me the headings and many of the sub-headings required. One of the key rules in Turbocharge your writing is to have a ‘golden hour’ in which you only write, and you ‘nail your feet to the floor’ – not leaving the desk (or checking Facebook) if it gets hard. Each morning I wrote for about 45 minutes to an hour and a half before coming in to work, leaving myself comment bubbles where I needed to find a reference or some information that I didn’t have. Fortunately, I knew the literature very well from previous projects, so didn’t need to do too much extra reading! How did you find the extra energy to do this? As I explicitly aimed to make the book reader friendly, I adopted a conversational style, and I found that the book flowed out of me without too much effort. I also had to be strict with myself, not taking every exciting opportunity that presented itself to contribute to a paper, grant application or committee. My only goal was to spend a minimum of 45 minutes writing at least four days a week. Some days I wrote loads, others not very much, but it balanced out in the end. Did you map out whole book chapters and sub chapters upfront? Did you use stickys? I did, from copying and pasting from the chapter outline, and then I used lots of scribbled notes and post-its to keep me on track. What surprised you most during the experience of creating the book? Last week I was looking over the proofs of the book, and I was amazed at how much I had covered and quite how big it was. Breaking it down into chapters, then sections, then sub-sections and finally paragraphs meant that it never felt that big. In writing this book, I realised that it wasn’t possible to make a book detailed enough to be methodologically robust and also accessible to undergraduate students. The next project is to write a shorter ‘how to’ guide aimed at undergraduate and masters students, which acknowledges the particular challenges for research design, sampling and ethics that come when documents are used as data. 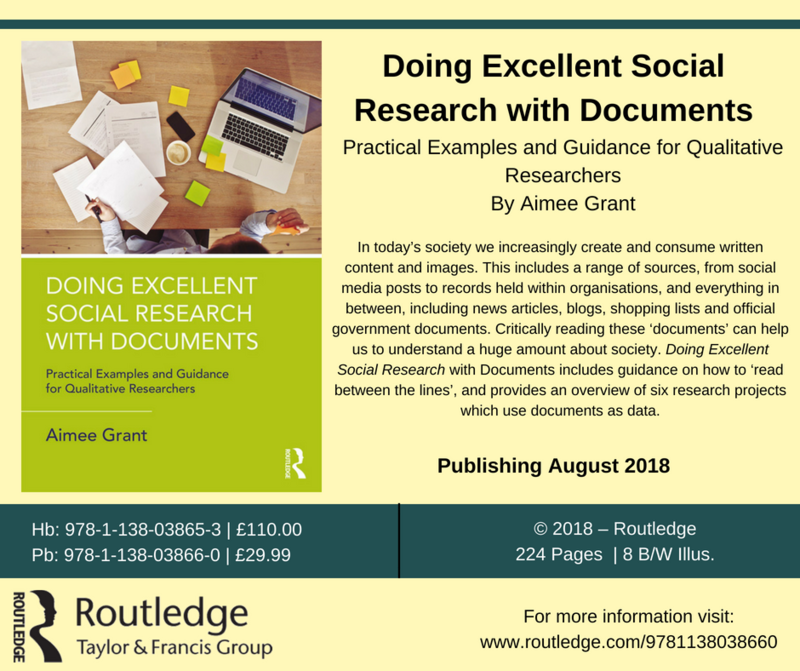 Doing EXCELLENT social research with documents: Practical examples and guidance for qualitative researchers. Abingdon: Routledge by Dr Aimee Grant is due for publication in August 2018 and is available for pre-order via Routledge.